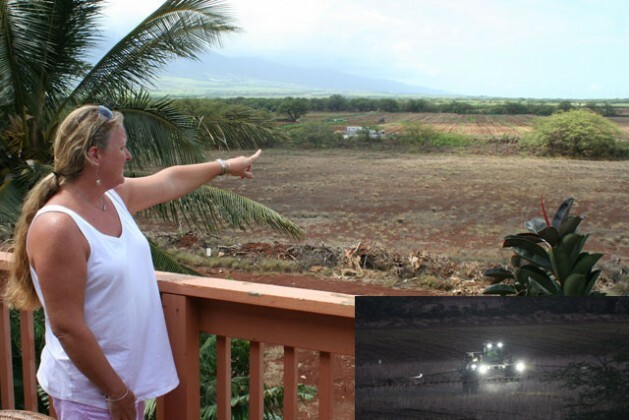 Tammy Brehio of Kihei, Hawaii, pointing from her back balcony to a Monsanto cornfield a few hundred yards from her house. The inset photo, taken by Tammy, shows a Monsanto tractor spraying pesticides. Credit: Photo by Christopher Pala. Inset photo by Tammy Brehio. KIHEI, Hawaii, Oct 16 2015 (IPS) - Tammy Brehio stood on the back balcony of her home in Kihei on the island of Maui and pointed to a brown field a few hundred yards away. She and a neighbour, who declined to be identified because he works for an agricultural company and feared losing his job, said the spraying often takes place at night. “It wakes me up, it smells really strong and it’s hard to breathe,” Brehio said. Whether or not the companies respect these laws, which forbid allowing pesticides sprayed on a field to drift beyond it, has become one of the biggest controversies in Hawaii in the past few years. Over the past decade or so, Monsanto, DuPont and Dow Chemical of the United States, Bayer and BASF of Germany and Syngenta of Switzerland have more than doubled their acreage in Hawaii. Attracted by a year-round growing season that cuts in half the time it takes to bring a new variety to market, they have turned the Aloha State into the epicentre of corn grown with genes modified in laboratories – designed mostly to tolerate the pesticides the companies produce and sell to farmers with the corn. The kernels grown in Hawaii are sent the mainland United States, where they are planted and harvested. Those kernels are then sold to farmers, whose production ends up mostly as cattle feed and ethanol. The corn sold as food is known as sweet corn and constitutes perhaps one percent of the industrial variety, which is known as field corn. The agro-chemical companies now own or lease about some 25,000 acres on the islands of Maui, Molokai, Kauai and Oahu – about 2 per cent of the land area. Because the islands are mountainous and farmland is scarce, the fields often abut homes, businesses and schools. Most of these fields were previously used to grow sugar cane and pineapple, and the towns grew around them in the 19th and 20th centuries. At any given time, about 80 per cent of the fields are bare and brown. The crops are grown in small patches of a few acres and sprayed often with pesticides, which residents complain that they often are forced to inhale. Even a mile from the nearest cornfield in downtown Waimea, on the island of Kauai, Lois Catala, 75, reports that the pesticide clouds percolate into her home with no warming. “All of a sudden, your eyes are burning and you’re itching all over, and you hear everybody complaining,” she said. A local doctor says she stopped biking to work on a road that bisects cornfields because she went through clouds of pesticides too many times. Other residents interviewed told of similar experiences. Testing new varieties of pesticide-resistant field corn and growing seed corn from them requires 17 times more restricted-use insecticides and more frequent applications than farmers in the US use for their crops, a study by the Center for Food Safety has concluded. Court documents filed by attorneys for Waimea homeowners who successfully sued DuPont for pesticide and dust impacts to their homes show the company sprayed 10 times the mainland average, based on internal pesticide records obtained from DuPont. The frequent, sometimes daily, sprayings have led to a spate of complaints that the companies violate with impunity federal and state laws. The laws say that commercial applicators who spray pesticides that winds carry out of their property is liable for a $25,000 fine and/or six months in jail. The pesticides receive approval from the federal Environmental Protection Agency only after being tested for their legal use, which does not include human inhalations. In 2006 and 2008, Howard Hurst was teaching special-education classes at Waimea Middle School, on Kauai, when clouds of what he believes were concentrated pesticides blew into the school from an adjoining field operated by Syngenta. “It feels like you have salt in your eyes, your tongue swells, your muscles ache, it’s awful,” he said in an interview at the school. Both times, the school was evacuated and several students were treated at the nearest emergency room. But the state authorities, instead of prosecuting the Swiss company, which denied that it was spraying on those days, insisted that the evacuations were caused by mass hysteria triggered by an onion-like plant called stinkweed. Without ever accepting responsibility, Syngenta stopped using the field adjacent to the school. The closest is now a half-kilometer away. Hurst said pesticide odors have become much less frequent. In 2013, the Kauai county council passed a law ordering the companies to create wider buffer zones and to disclose in far more detail than they do now what they spray, where and when. A group of doctors in Waimea, which is surrounded by cornfields on three sides, testified that the number of cases of serious heart defects in local newborns was 10 times the national rate. Meanwhile, in Honolulu, a pediatrician said in an interview that he’d noticed a statewide spike in another birth defect called gastroschisis, in which the baby is born with the abdominal organs outside. “Data suggest that there may also be an association between parental pesticide use and adverse birth outcomes including physical birth defects,” the American Academy of Pediatrics reported this year. “I think it’s serious,” says Bernard Riola, a pediatrician in Waimea. “We need an in-depth epidemiological study. Right now, we just don’t know” if the pesticides are causing the birth defects. Another doctor at the hospital said he tried to get the state to do just such a study, to no avail. Bennette Misalucha, the head of the agro-chemical companies trade group, the Hawaii Crop Improvement Association, dismissed the doctors’ concerns. “We have not seen any credible source of statistical health information to support the claims,” she wrote in an e-mail after declining to be interviewed. The companies she represents strongly opposed the buffer-zones and disclosure law, which resembled others passed in 11 other states. They argued that it would drive away the companies and cause job losses, and that critics of the pesticide-drift problem were simply victims of scare-mongering by opponents of genetically modified food. They sued and a federal judge struck the law down, arguing that only the state can regulate pesticide use. Civil Beat, a Hawaii news site, reported here that it effectively does not. In Maui and Molokai, which form one county, a bitterly fought ballot initiative was approved by the voters in November 2014 banning genetically modified agriculture until an Environment Impact Statement is performed and proves the industry is safe. The companies spent $8 million to fight it, reportedly the most spent on any political campaign in Hawaii history. Another federal judge struck it down on the same grounds as the Kauai ordinance: that only the state can regulate pesticide use. Both rulings are being appealed. Back in Maui, Brehio, the mother of three who says she is dispirited by the lack of progress in curbing illegal pesticide drift, was remodeling her kitchen with her husband and preparing to sell their house. “This is a not a safe place for me and my family,” she said. Meanwhile, construction has started on a strip of land between her house and the Monsanto field for a 660-unit affordable-housing development where the cheapest units will be right against the Monsanto fields. mahalo chris for sharing this information far & wide. it is really pathetic that reasonable regulatory requests such as such disclosure, notification and buffer zones are resisted by the chem corp guys. there ought to bee a law! Great Article, thank god some journalist are actually still practicing journalism. Well looks like EFSA is just as corrupt as the FDA. There testing is a fraud, and we proved it, and EFSA says so what! EFSA Says Glyphosate Contaminated Lab Chow Okay! I am shocked that the international banksters that created the Euro are not looking out for food safety…like you said earlier stack silver, stock up on the three bs and the lightest of all to carry in a good bag, the skills. Anthony has been doing amazing research on a shoe string budget. They should burn those fields like people did in Hungary!